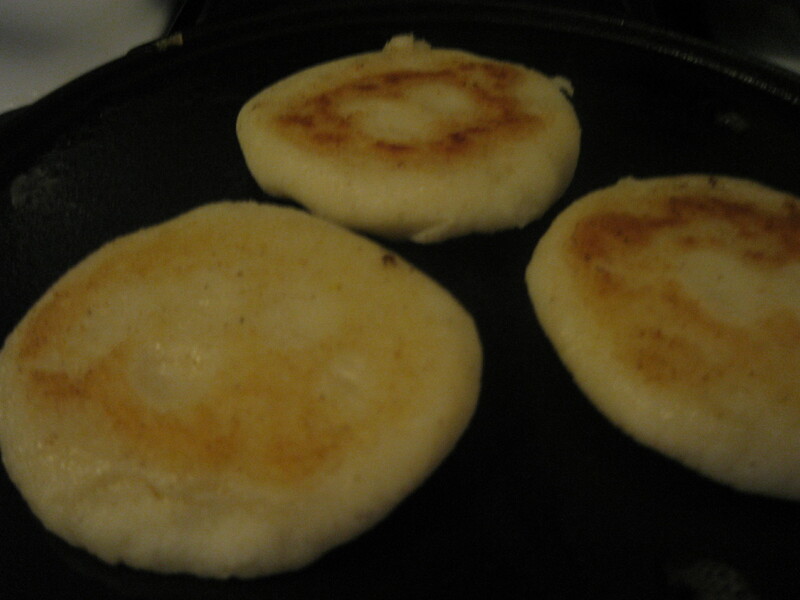 I reached out to my Venezuelan cousins for the basic arepa recipe they grew up eating. Outside of specifying P.A.N. pre-cooked cornmeal, they weren’t exacting about measurements; but I got a sense of what to look for and loved the result. 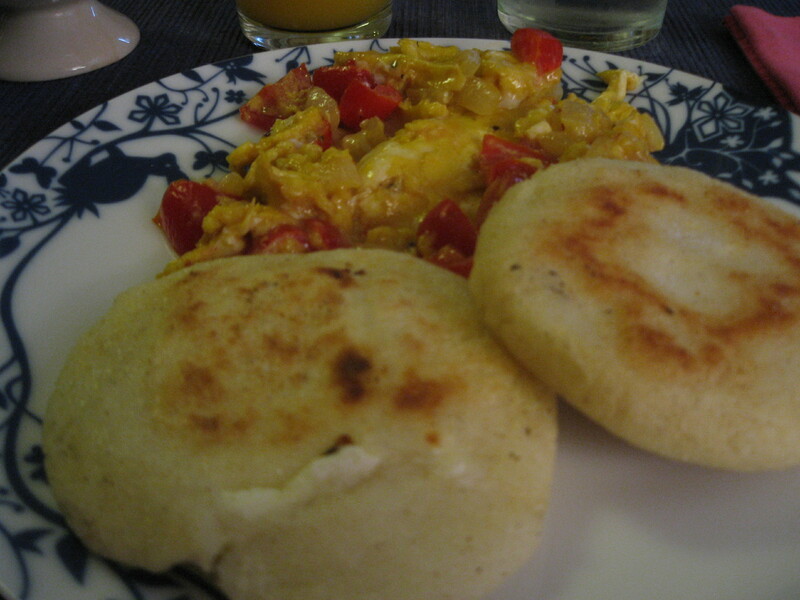 I tried again it again this morning and served them with Venezuelan perico, scrambled eggs with onions and tomatoes. You put about a cup of very hot water in a bowl and then add the P.A.N. harina little by little as you mix it with the water. If you add it all at once it will take longer and be lumpy. Let it sit for five minutes so that it has the consistency of playdough but a bit softer. Once you have it right, you roll the mix into a golf balls then start to flatten the balls into a disc shape. If the edges crack a lot then you have to add more water to the mix and start over, but a little cracking is okay. Get a pan, heat it up and add butter then cook the arepas so that the outside is crunchy. A few of minutes on each side. Place the arepas in the preheated oven for about 15-20 minutes. You’ll know when they’re ready when you take them out of the oven if you pat them on top and they sound hollowish. Makes 6-8 medium sized arepas. *Kako and I went to elementary school together which should explain the references to play dough and why I still call a 34-year old, well-traveled, married cinematographer named Carlos – Kako. ME GUSTARIA SABER PORQUE ESTA PAGINA CON RECETAS DE LATINOAMERICA ES EXVLUSIVAMENTE EN INGLES.